Last week, having redesigned the Lightbox feature, Blogger released it for a second attempt. As with any Blogger feature, it now deserves a closer look. 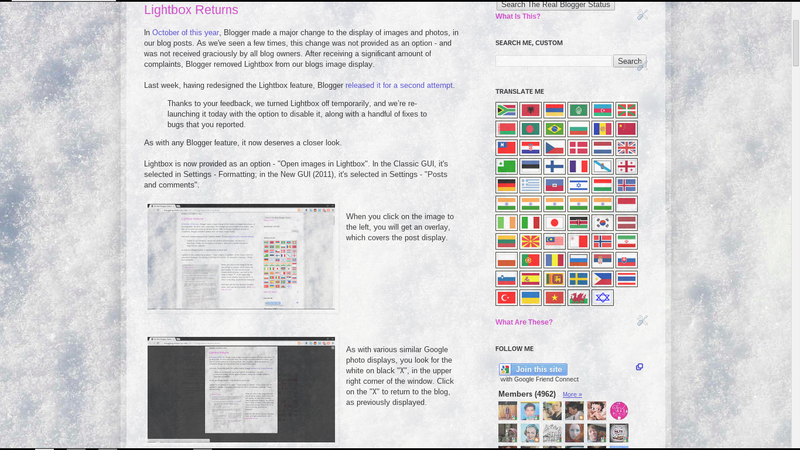 Lightbox is now provided as an option - "Open images in Lightbox". In the Classic GUI, it's selected in Settings - Formatting; in the New GUI (2011), it's selected in Settings - "Posts and comments". When you click on the image to the left, you will get an overlay, which covers the post display. As with various similar Google photo displays, you look for the white on black "X", in the upper right corner of the window. 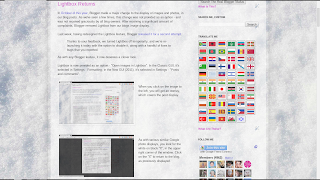 Click on the "X" to return to the blog, as previously displayed. 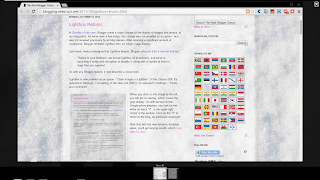 Blogger has stated that the setting enables or disables it for the entire blog. Separately, they also stated that the setting is disabled, by default. You might do well to check your setting at least once, as some folks have found the setting enabled, by default. Thank you for explaining. I didn't know even know the name Lightbox! Just knew I didn't like it. Now I've disabled it on my blogs.